Mokhtari, H. (2015). A mixed integer linear programming formulation for a multi-stage, multi-Product, multi-vehicle aggregate production-distribution planning problem. Journal of Industrial Engineering and Management Studies, 2(2), 55-82. H. Mokhtari. "A mixed integer linear programming formulation for a multi-stage, multi-Product, multi-vehicle aggregate production-distribution planning problem". 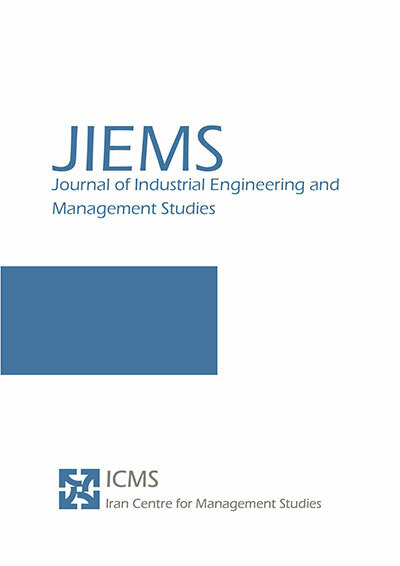 Journal of Industrial Engineering and Management Studies, 2, 2, 2015, 55-82. Mokhtari, H. (2015). 'A mixed integer linear programming formulation for a multi-stage, multi-Product, multi-vehicle aggregate production-distribution planning problem', Journal of Industrial Engineering and Management Studies, 2(2), pp. 55-82. Mokhtari, H. A mixed integer linear programming formulation for a multi-stage, multi-Product, multi-vehicle aggregate production-distribution planning problem. Journal of Industrial Engineering and Management Studies, 2015; 2(2): 55-82. Head of Department of Industrial Engineering, University of Kashan. In today’s competitive market place, companies seek an efficient structure of supply chain so as to provide customers with highest value and achieve competitive advantage. This requires a broader perspective than just the borders of an individual company during a supply chain. This paper investigates an aggregate production planning problem integrated with distribution issues in a supply chain so as to simultaneously optimize characteristics of these supply chain drivers. The main contribution of this paper is to consider the aggregate production-distribution planning (APDP) problem jointly with multiple stage, multiple product, and multiple vehicle. Moreover, we considered both routing and direct shipment as transportation system which is not considered in APDP literature so far. A mixed-integer linear programming formulation is suggested for two distinct Scenarios: (i) when we have direct shipment in which all shipments are transported directly from manufacturer to customers, and (ii) when we have routing option in which the vehicles can move through routes to deliver products to more than one customer at a trip. A numerical analysis is performed to compare performance of problem in two above Scenarios. Moreover, to assess applicability of problem, some computational experiments are implemented on small, medium and large sized problems. Aliev, Rafik A., et al., 2007, “Fuzzy-genetic approach to aggregate production–distribution planning in supply chain management’, Information Sciences, 177, 4241-4255. Ashayeri J, Selen W., 2003, “A production planning model and a case study for the pharmaceutical industry in the Netherlands”, Journal of Logistics: Research and Applications, 6, 37–50. Bard JF, Nananukul N., 2009, “The integrated production–inventory–distribution–routing problem”, Journal of Scheduling, 12, 257–80. Boudia M, Louly MAO, Prins C., 2007, “A reactive GRASP and path relinking for a combined production–distribution problem”, Computers & Operations Research, 34, 3402–3519. Chan FTS, Chung SH, Wadhwa S., 2005, “A hybrid genetic algorithm for production and distribution”, Omega, 33, 345–55. Coronado JL., 2008, “An optimization model for strategic supply chain design under stochastic capacity disruptions. Texas: College of Engineering”, Texas A&M University; 1–110. Demirli K, Yimer AD., 2006, “Production–distribution planning with fuzzy costs. In: Proceedings of annual meeting of North American fuzzy information processing society”, (NAFIPS 2006). 702–707. Fahimnia, B., Farahani, R.Z., Marian, R. Luong, L., 2013, “A review and critique on integrated production–distribution planning models and techniques”, Journal of Manufacturing Systems, 32, 1–19. Ghasemy Yaghin, R., Torabi, S.A., and Fatemi Ghomi S.M.T., 2012, “Integrated markdown pricing and aggregate production planning in a two echelon supply chain: A hybrid fuzzy multiple objective approach”, Applied Mathematical Modelling, 36, 6011–6030. Haehling LC., 1970, “Production and employment scheduling in multi-stage production systems”, Naval Research Logistics Quarterly, 17(2), 193 –8. Hamedi M, Farahani RZ, Husseini MM, Esmaeilian GR., 2009, “A distribution planning model for natural gas supply chain: a case study”, Energy Policy, 37, 799–812. Holt CC, Modigliani F, Simmon HA., 1955, “A linear decision rule for production and employment scheduling”, Management Science, 2(1), 1–30. Jain, A., and Palekar, U.S., 2005, “Aggregate production planning for a continuous reconfigurable manufacturing process”, Computers & Operations Research, 32, 1213–1236. Jamalnia, A., and Soukhakian, M.A., 2009, “A hybrid fuzzy goal programming approach with different goal priorities to aggregate production planning”, Computers & Industrial Engineering, 56, 1474–1486. Karimi-Nasab, M., and Fatemi Ghomi S.M.T., 2012, “Multi-objective production scheduling with controllable processing times and sequence-dependent setups for deteriorating items”, International Journal of Production Research, 50, (24), 7378-7400. Karmarkar, U.S., and Rajaram, K., 2012, “Aggregate production planning for process industries under oligopolistic competition”, European Journal of Operational Research, 223, 680–689. Lee YH, Kim SH., 2002, “Production–distribution planning in supply chain considering capacity constraints”, Computers & Industrial Engineering; 43, 169–190. Ma, H.L. Felix T.S. Chan and Chung, S.H., 2013, “Minimizing earliness and tardiness by integrating production scheduling with shipping information”, International Journal of Production Research, 51, (8), 2253-2267. Moattar Husseini, Zohre, et al., 2015, “Multi-objective integrated production distribution planning concerning manufacturing partners”, International Journal of Computer Integrated Manufacturing. 28, 1313-1330. Moghaddam, Mohsen, Masoud Rabbani, and Babak Maleki-Shoja, 2012, “Integrating lateral transshipment to aggregate production–distribution planning considering time value of money and exchange rate” International Journal of Operational Research, 13, 439-464. Niknamfar, Amir Hossein, Seyed Taghi Akhavan Niaki, and Seyed Hamid Reza Pasandideh, 2015, “Robust optimization approach for an aggregate production–distribution planning in a three-level supply chain”, The International Journal of Advanced Manufacturing Technology, 76, 623-634. Nishi T, Konishi M, Ago M., 2007, “A distributed decision-making system for integrated optimization of production scheduling and distribution for aluminum production line”, Computers & Chemical Engineering, 31:1205–1221. Pathak, Savita, and Seema Sarkar, 2012, “A fuzzy optimization model to the aggregate production/distribution planning decision in a multi-item supply chain network”, International Journal of Management Science and Engineering Management, 7, 163-173. Perumal, Ashoka Varthanan, N. Murugan, and G. Mohan Kumar, 2013, “A discrete PSO approach for generating an integrated multi-plant aggregate production-distribution plan”, International Journal of Knowledge-based and Intelligent Engineering Systems, 17, 195-207. Raa, B. Dullaert, W., and Aghezzaf, EL-H., 2013, “A matheuristic for aggregate production–distribution planning with mould sharing”, Int. J. Production Economics, 145, 29–37. Rizk N, Martel A, D’Amours S., 2006, “Multi-item dynamic production–distribution planning in process industries with divergent finishing stages”, Computers & Operations Research, 33, 3600–3623. Torabi, S. A., and M. Moghaddam, 2012, “Multi-site integrated production-distribution planning with trans-shipment: a fuzzy goal programming approach”, International Journal of Production Research, 50, 1726-1748. Wang, R-C, and Liang, T-F., 2005, “Applying possibilistic linear programming to aggregate production planning”, Int. J. of Production Economics, 98, 328–341. Wang, R-C, and Liang, T-F., 2004, “Application of fuzzy multi-objective linear programming to aggregate production planning”, Computers and Industrial Engineering, 46, 17–41. Wong, C.S., Felix T.S. Chan and Chung, S.H., 2012, “A genetic algorithm approach for production scheduling with mould maintenance consideration”, International Journal of Production Research, 50, (20), 5683-5697. Wong, C.S., Felix T.S. Chan, and Chung, S.H., 2014, “Decision-making on multi-mould maintenance in production scheduling”, International Journal of Production Research, 52, (19), 5640-5655. Zhang, R., Zhang, L., Xiao, Y., and Kaku, I., 2012, “The activity-based aggregate production planning with capacity expansion in manufacturing systems”, Computers & Industrial Engineering, 62, 491–503.